According to Business Insider, 80% of the businesses will implement chatbots by the year 2020. 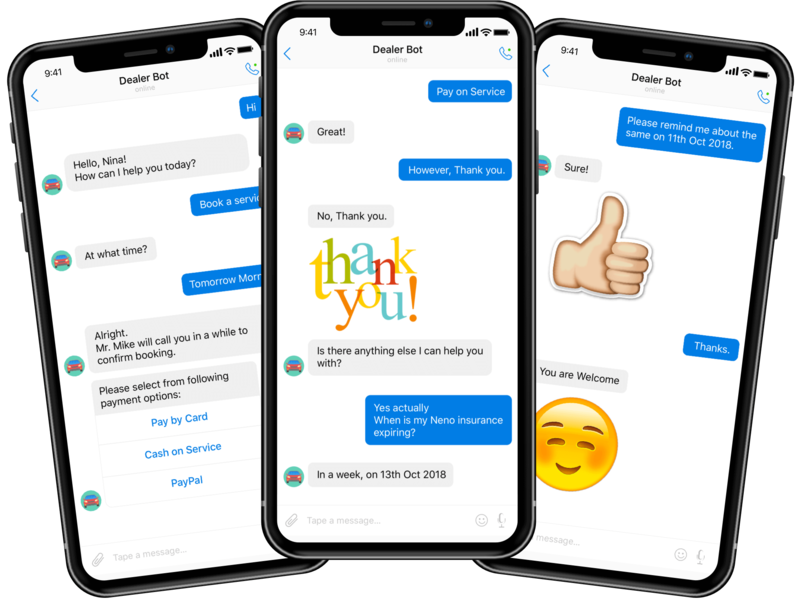 In today’s internet age, messaging chatbot is one of the latest innovative technology that is making its mark for almost all business verticals. 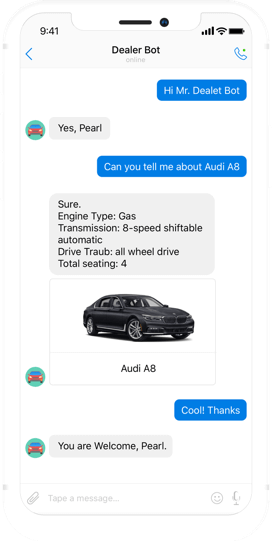 Chatbots are becoming the primary driving force behind communication between brands and customers, automotive sector is no exception. Chatbot helps build and maintain auto dealer’s online presence in several better ways. It not only provide customer support, but also drive more sale. Whether customers want car servicing reminder or book test drive of a car, a chatbot can help round the clock. Your customers will no longer have to bear long calls or receive variety of answers from customer representatives. The global chatbot market is expected to reach $1.23 billion by 2025. 47% customers buy items from chatbot. 4.5 Billion USD expected to be invested in enterprise intelligent assistants. Chatbot can help promote your Auto Dealership Business to larger audience. Chatbot can play major role in attending fresh lead and improving conversion rate. Chabot ensures that customers get answers to their queries as fast as possible. Chatbot can provide precise and accurate information to your customers. Chatbot are capable of acting direct link between customers and auto dealer business by being available round the clock. Chatbot engagement with customers can lead to increase in sales for your auto dealership business. Chatbot can share various cars details, price and brochures with customers. Moreover, it can also collect reviews and feedbacks from customers. Chatbot can ease various customers processes such as purchasing, making payment online, make a booking, enquiring about a car and much more. Hire Chatbot developers from Let’s Nurture who have extensive experience in Intelligent Chatbot Solution development using AI, NLP and Machine Learning technologies. Chatbot developers have expertise in SMS API, NLP engine, API.AI, Google Geocoding API and much more to create engaging auto dealer mobile application along with built-in chatbot interface. Let’s Nurture developers have built various NLP (Natural Language Processing) based self learning chatbots for numerous car dealers. These chatbots uses AI (Artificial Intelligence) to engage customers to your dealership mobile app and website, by answering to customer queries just like customer service agent. 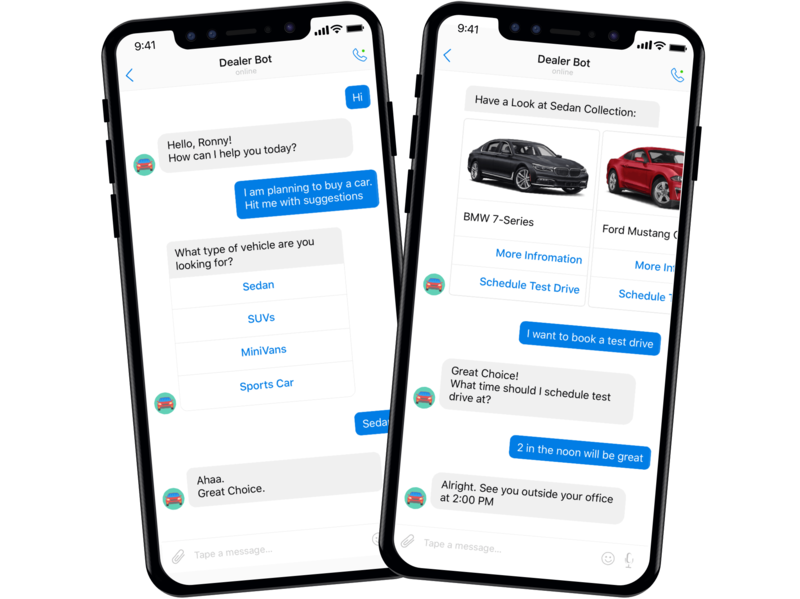 Have an idea to develop chatbot for your Auto Dealership Business? Can I integrate Chatbot with existing auto dealer company web and mobile app? It is not mandatory to host the Chatbot on a separate server. We can develop and integrate the Chatbot to the same server that runs web or mobile app for an auto dealer company. Which type of Chatbot should be integrated with auto dealer company application? Converational and flow based Chatbots can be built and integrated with auto dealer company’s web and mobile applications. Can you provide option to hire dedicated Chatbot developers for my auto dealer app? Have an !dea or need help with your chatbot for Auto Dealer?